? Tips you need to become a Fantasy Cricket Champion is now at your fingertips! - for Dream 11, MyTeam11, CricPlay, Halaplay, Nostra Pro, Fantain etc. ✔️ We provide regular Cricket news, Insights, Live Stats, Previews, Coverage, Analysis and much more. ?? What is a balanced team for dream league? ?? Which player is likely to score good in today’s match for dream league? ?? Where do I get detailed predictions, previews for all cricket matches? ?? How do I know Injured Players or Unavailable players? DreamTeam11 will help you rank higher on Dream 11 Fantasy Cricket, Halaplay, Nostra Pro, Fantain, MyTeam11. We provide predictions and news for all the domestic & international cricket matches. Specially for dream 11 fantasy cricket. *Quick Updates and notifications on Injured Players or Unavailable Players. Our experts do analysis of games highlights, statics and prepare match predictions. We cover Dream11, MyTeam11, Halaplay, NostraPro, Fantain, CricPlay. We will add soccer predictions soon. 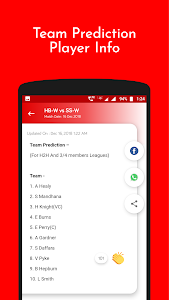 You can use this app for getting useful Dream 11 Prediction for today cricket match. Also you get Cricplay Prediction with this. We give you possible 11 team. By which you can play safe for today match prediction. We give you all Fantasy Predictions for all apps like Cricplay in one app. So you don't have to worry about fantasy cricket tips. 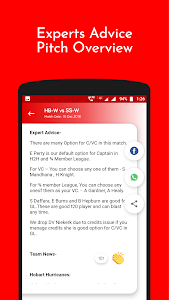 You will get help for Dream11 app today cricket match. We inform you for every injured player for Dream11 app for today cricket match. We provide Dream11 tips and dream11 team. We provide prediction for IPL cricket game also. We provide >90% accurate Dream 11 Predictions. Which is also commented in reviews by our users. If you get this much Dream 11 Predictions by only reading, then it is great. You get Dream 11 fantasy cricket tips for today match prediction. Do you want to take your Dream11, Halaplay ranking to next levels? ✔️ DreamTeam11 is a free advice/opinion/suggestions for Dream11 fantasy cricket team. Its up to you to verify and use. 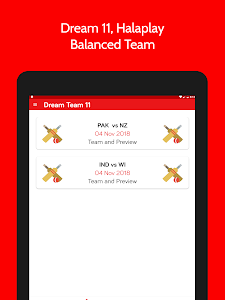 ✔️ DreamTeam11 app, in any way, is not affiliated/managed/operated by Dream11. Made with ❤️ by NewStar Tech Team.
? 99% Matches Accurate Predictions! ✅ Get balanced teams, detailed predictions, news of Injured Players & Tips.
? Best, flawless app with smooth UI.
? NO Annoying ADS, content that you need only.
? Clap Feature to let you appreciate post.
? Manage notifications in Settings. 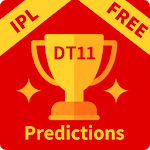 Similar to "DT11 - Predictions, Tips, Teams"